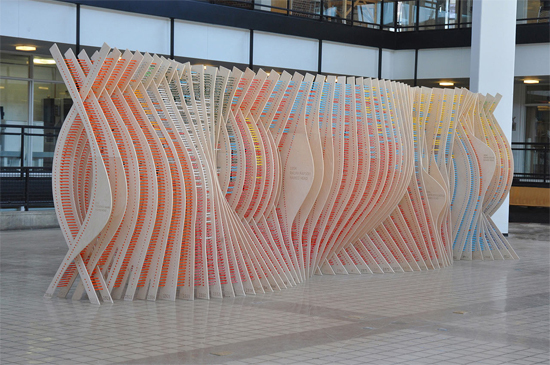 The Centenial Chromagraph is an installation/ data visualization portraying the history of the University of Minnesota School of Architecture.Their creators refer to it as an exercise in data spatialization where the use of computational tools were employed to generate formal and spatial constructions with large quantities of data. 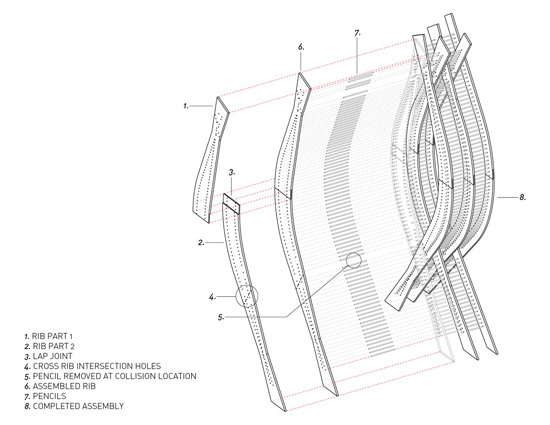 In this case the information collected over the 100-year history of UMN’s architecture school. 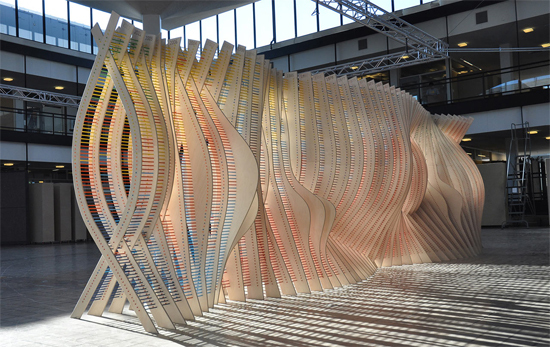 The installation consists of 100 robotically routed plywood ribs, joined together with 8,080 colored #2 pencils. The curvature of the ribs expresses major historical eras and periods of the School—the tenures of its leadership, the buildings it has occupied, the colleges it has belonged to—while the color of the pencils reflects the changing composition of the School’s degree programs over the past century. 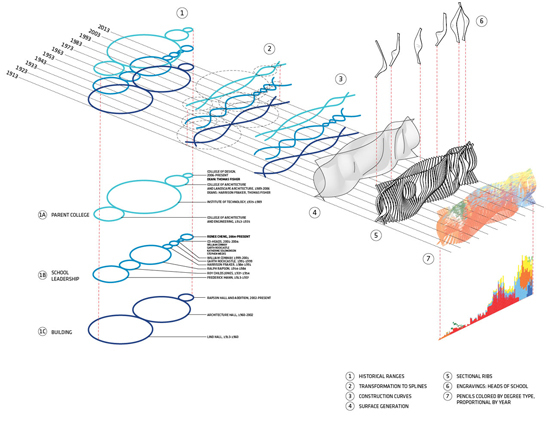 For example, the tenure of Ralph Rapson as head of the School of Architecture is evident in the large thirty-year curve that swells out in the center of the piece. 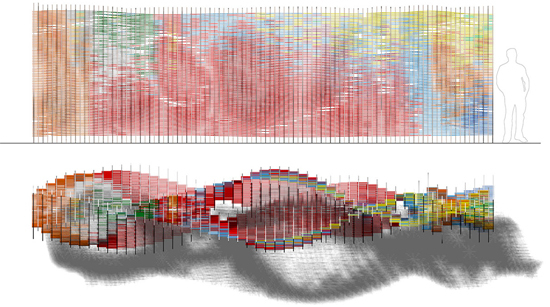 Similarly, the prevalence of the Bachelor of Architecture degree, which began in the 1930´s and lasted until the late 1990´s, is legible in the large number of red pencils that extend across that 60-year period. When the exhibition of this piece concluded all the pencils employed were given to alumni and friends of the School as souvenirs of the celebration. 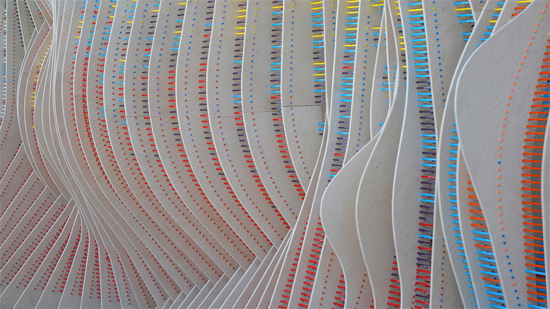 Centennial Chromagraph: Fabrication, Finishing, Assembly from Adam Marcus on Vimeo.